Papin: "Renault is clearly punching above its weight." 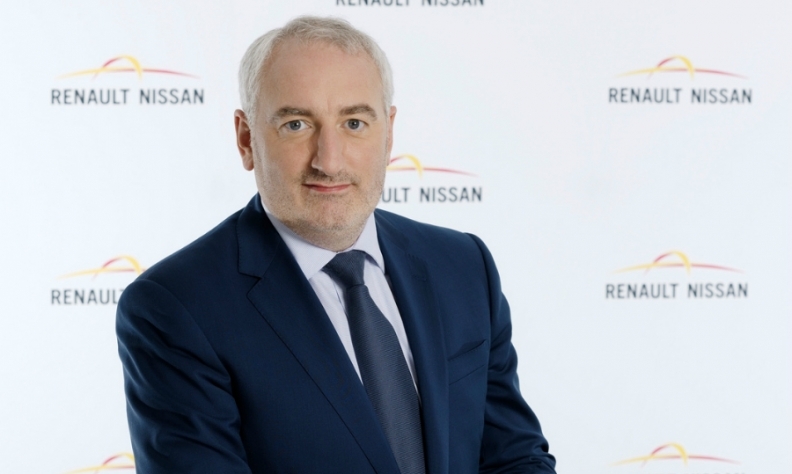 Renault sees big benefits working with Nissan and the two newest members of their alliance, Russia's AvtoVAZ and Japan's Mitsubishi Motors. Top Renault strategist Jeremie Papin gave an overview of the alliance's strategy including growth markets such as China and new business areas such as autonomous cars and mobility services. Papin, 43, an alliance global director and Renault executive vice president, is responsible for strategic partnerships and new ventures. He reports directly to Renault-Nissan CEO Carlos Ghosn. Papin was interviewed at Renault Group's headquarters outside of Paris by Automotive News Europe correspondent Peter Sigal. The industry is consolidating with General Motors' sale of Opel to PSA Group and Fiat Automobiles CEO Sergio Marchionne's desire to find a buyer for FCA. What is the advantage of the Renault-Nissan alliance structure compared with fully combining or acquiring companies? This is a fixed-cost industry, so size matters. For us, what the others are doing is only evidence that size matters. The beauty of the alliance is that Renault does not need to fight for size, Nissan does not need to fight for size. And now Mitsubishi is part of the alliance. We can focus on making that scale work to our benefit. How will you put that scale to work for the newest members of the alliance, AvtoVAZ and Mitsubishi? There are two aspects. To be global, you need a full range of SUVs, sedans and hatchbacks, and all types of powertrain technology to be relevant in many markets. So, when smaller companies such as AvtoVAZ and its 300,000 units or Mitsubishi with 900,000 join the alliance, we can make available platforms and technologies that are relevant to them. If we get them on our platforms, we can go to a supplier and say, we are no longer asking for 100,000 or 200,000 parts, but we are asking for 400,000 parts. Obviously, the prices that we get are meaningfully different on what is still 70 percent of the cost of a car. How does Renault benefit from the alliance? It means Renault is clearly punching above its weight. We have a full SUV lineup, we have EVs, we have strong diesel engines, we have a full set of gasoline engines. We have been growing market share in Europe, we have grown market share in Russia despite the market's decline. We are the fastest market-share gainer in India. In China, we went from building a plant to launching the first cars in two years. There is no other company of that size that has done so much in the past few years. The only reason that's been possible is that the costs have been shared with Nissan. The alliance now has a standalone business unit for light commercial vehicles. Is it a blueprint for a higher integration? On LCVs, Renault has strengths that are very complementary to areas of strength at Nissan, both from a product angle and a geographic angle. It made sense to move from a situation where goodwill and good work between people is replaced by one very strong, talented manager (Ashwani Gupta, who started as chief of the LCV unit April 1). Can we have it in other areas? I can't say for sure, but the evolution of the alliance is not driven by changing for the sake of change. How much of the Renault-Nissan product portfolio was using shared platforms and powertrains last year, compared with five years ago? Where do you hope to be five years from now? Shared modules have moved to about 60 percent of Renault's construction costs from less than 10 percent. When you are doing a very good job at having platforms in common and powertrains in common and sharing as much as you can that the customer doesn't see, you are probably doing something that is at 65 percent to 70 percent. I don’t know where the limit is, but we are approaching the limit. It will be hard to go much beyond 70 percent without the risk that our products are too alike. Why were the Renault Zoe and Nissan Leaf electric vehicles built on different platforms and will they share underpinnings in future? We are talking about things that happened eight or nine years ago. It appeared that it was a better decision for both businesses to derive Leaf and Zoe from existing assets. When those cars need to be renewed I cannot imagine that what we are trying to do systematically for all other cars will not be applied to EVs. China has proposed carbon caps that would require automakers to achieve 8 percent of sales for electric cars and plug-in hybrids in 2018. Is that time frame possible for the alliance? We have the technology, and we have known the rules for a long time. So we will comply. When will autonomous cars make an impact on Renault's and Nissan's bottom lines? When you bring these types of capabilities and enhancement to the product, the take rate will be there. In Japan last year, we launched the Nissan Serena, which is a very mainstream product, with some simple autonomous features (ProPilot, a type of adaptive cruise control that also includes self-steering). It's been a huge success in terms of the take rate, about 60 to 70 percent, so two thirds of the buyers are paying a premium to have it. Are car sharing and mobility services viable financial models? There is not a risk of selling fewer cars. In some global markets the level of car ownership is meaningfully lower than in Western, well-developed markets, and there is no reason why people who will need cars will have to own one. In large cities with congestion, parking difficulties, emission rules and maybe usage restrictions, you will have large numbers of people who don't want to have the hassle of owning. Whether someone wants to buy a car and own it, or just ride in a car and I supply that ride to them, makes no difference. What are Renault's key global markets for Renault? Would you ever expand your presence to include the United States? For me, the U.S. comes after India and China, but I don't think it is a necessity. The future of Renault is more about succeeding where we started than opening up new markets. Our most important focus is to succeed and take market share in China. China is a 27 million to 28 million market. We sold 35,000 vehicles last year. This is a pure, pure growth opportunity. India should very well become the third-largest automotive market. We plan to build on our success and feed our dealers with more cars that are competitive and attractive. The Kwid (small crossover) has been a success. We have a well-established presence for the Renault brand in Russia and Brazil. We see no reason we can't benefit from the expected recovery of those markets, given where they are in their cycles. Will tech giant such as a Google or a Microsoft ever buy an automaker? Do they have the money to buy? Yes. But do they want to buy with the legacy of complexity of building cars? Frankly, I think their shareholders would be surprised if they moved from very strong double-digit, hugely cash-generative businesses to the industry in which we live, where we struggle with all kinds of considerations that they don't need to deal with. I think the future is more about technology partnerships and how we work together on our areas of skills.